I want to tell you about Charles Lane Press' newly-released limited editions. We have chosen two images featured in Fall River Boys. 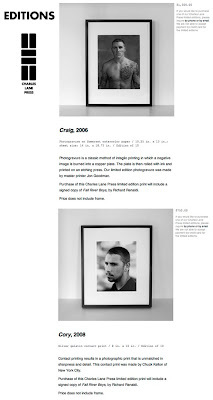 Craig, a 10" x 13" photogravure on Somerset Watercolor paper and Cory, an 8" x 10" original contact print. These editions are truly limited as they are both in a very small edition size of 10. Charles Lane Press is hard at work on our next book Outerland by Allison Davies. Through the sale of our editions we are planning for Charles Lane Press to expand and to produce many more thoughtfully edited and beautifully printed photo books. Please consider contributing to the growth of our exciting new venture and becoming the proud owner of either or both of these gorgeous prints.